Copacabana has been an icon in NYC nightlife for decades. 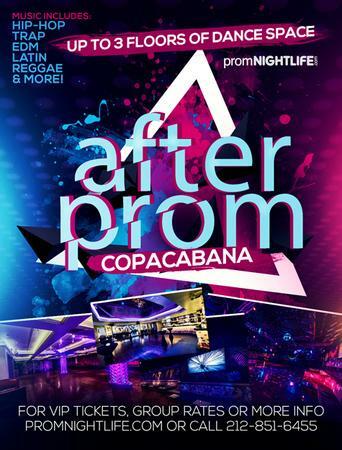 Set your after prom plans at one of the hottest clubs in Times Square – Copacabana! It is one of the most versatile nightclub venues in all of Manhattan. With 3 floors of party space, capacity for over a thousand party goers, and located in the center of the world – Times Square, it’s no wonder why Copacabana has been the leading after prom spot for years. Your prom night only comes around once in a lifetime. Who wants to take any chances with the after party plans? Feel secure and go with the safe bet. Copa has been an iconic symbol of NYC nightlife for decades. From its years as a Latin fueled hot spot to its current day form as a premier nightclub space for all types of events – Copacabana has it all. For every after prom night at Copa, we roll out the red carpet for all those who are looking for the prestige nightlife experience. Over the years, we’ve seen it all – the crocodile skin leather shoes, the fancy hair do’s, double-decker party buses and of course – the best party crowd in the world! Notable DJ’s this year will include Camilo, Spin King, Enuff, Petie Smallzz, Nyce, among others – playing the hottest in House, Hip-Hop, Reggae, Open-Format, Latin, Dub Step, EDM, and more! Cover Notes: General Admission: USD 45.00, VIP Admission: USD 60.00.